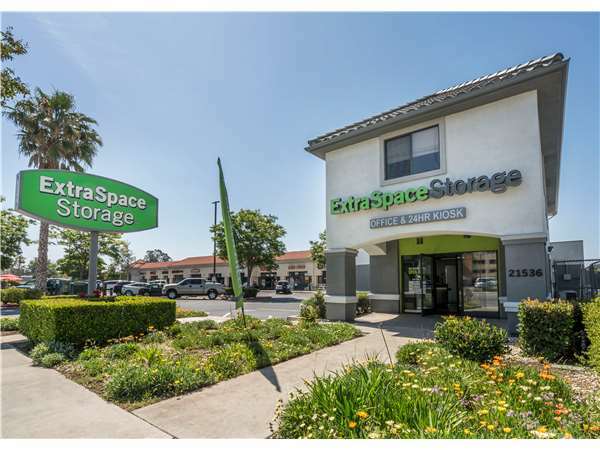 Located on Devonshire St just west of Topanga Canyon Blvd, Extra Space Storage serves residents of Chatsworth, Box Canyon, Canoga Park, Porter Ranch, and Northridge. Locals will recognize our facility next to the U.S. Post Office across the street from Travelodge Chatsworth. With a large selection of storage units and amenities like vehicle storage, Extra Space Storage on Devonshire St is the self storage solution for you in Chatsworth! Our Devonshire St storage facility offers storage units in sizes 5x5 to 20x20. Units come with features like first-floor access, drive-up access, and outdoor vehicle parking to handle a wide range of needs. Need to store a vehicle in Chatsworth? Extra Space Storage offers 8x12 to 10x25 outdoor parking spaces and 5x15 to 20x20 drive-up units to accommodate cars, motorcycles, boats, and RVs. At Extra Space Storage in Chatsworth, security is our top priority. To ensure that your belongings are safe, our facility has an on-site resident manager, video surveillance, and electronic gate access. When you rent a storage unit at Extra Space Storage, you can expect a clean, secure, well-maintained facility and a friendly, professional staff dedicated to excellent customer service. Contact us today to reserve a storage unit in Chatsworth! Not a bad place to go for your storage needs! Totally accessible...clean, affordable! This has been an easy process for my transitional needs! Thank you... I feel confident in my decision to go with this place! Great experience so far. Staff was knowledgeable and accommodating. Location was clean, secure, and appealing. The people here are very very good. They helped me decide which size unit I needed and did not try to sell me a larger unit. 100 percent excellent experience... Great service.. convenient location.. truck, driver, Dolly, hand cart included... Climate control, secure, easy to use Freight elevator, convenient drive up loading and unloading. Highest recommendation! ???? Do not rent here, I repeat do not rent here. Someone broke into my unit and stole some of my items and literally went through ALL of my belongings. Papers, boxes, and all. The manager all site never came out, I had to wait until police got here to do a report. I pay a premium account for my unit to have anyone break into my unit. It's not okay. Rent someone else! Everything about this facility is great. Very helpful, accommodating, professional, and caring staff. Facility is clean, secure and I always feel safe when I'm there. It couldn't be any better. The facility was very well maintained. Diana was great in helping me find the best solution for my needs at the best price. Couldn't have gone any smoother. Highly recommend this facility. I found this storage place to be clean, and very safe. The woman working there was very helpful and answered all my questions. They also have locks, boxes and tape if you need it. I booked my storage on the 9th and I have to say it was made so easy by Mr. Guillermo. I called about 45mins before they were scheduled to close. Guillermo answered my call and assured me he would wait for me to come in to show me what they still had available. He showed me 3 different spaces, so I would see my options. He never rushed me even though it was already pretty much closing time. He even said I could put one on hold if I wanted to think about it and just book the next day so I could take my time. Over all great experience I booked that same day and yes I agree with everyone else. The place is super clean and as a lady I feel safe being there alone to. I love the staff here they really do remember your face and name you’re not just another number to them. Thank You Guillermo!!!! Extra Space Storage is a wonderful facility that is tucked safely back from the main street. Although its office sits right on Devonshire, the rest of the facility is protected by the surrounding buildings and makes it easy to go completely unnoticed even when actively looking for it. Its secure entrance and well lit property make me feel safe there even as a woman when alone at night; however, it's comforting to know that the groundsman actually lives on the property for extra security as well. The office is very nice with access to bathrooms and water during normal operating hours. The employees are friendly and helpful and did everything they could to accommodate our needs. Guillermo showed us several units in our price range to make sure that we found the one that was perfect for our current situation and even offered to match the special offer we found online for one unit if a different one suited our needs better. Overall we couldn't be happier with our choice. Always someone in the office for assistance. Very very clean. Overall they make moving and reorganizing a breeze. I dont typically write reviews, but the team at this facility is amazing!!! If you need anything the guys running the place will try to make it happen. Pricing is fair, place is clean! Try to get a roll up door if you want to fill your unit, the hinge doors can block a little space when open. I highly recommend! I am very happy using this storage place...it's safe, convenient, and very very clean!! really the storage was a nice place and save to your car . thank you ,also i want to say thanks for the staff because the staff try to help . The location is easy to get into and out of. The property is always clean. The staff is curtius and helpfull. The prices are reasonable. Always there, always clean and always safe here...the office stafff are exceptional and are a pleasure to work with, they really care. Love the facility..It's clean & secure, the prices are competitive, staff are friendly & VERY helpful & the hours of operation are just what I need. I am a local business owner (Real Estate Company) and Extra Space Storage works with my clients, helping them find the right storage space to meet all their individual needs at a price they can afford even in these difficult times. Thanks E S S for enhancing our Chatsworth community..Keep up the good work! I really like my storage locker. I feel like the price is worth the service I get. It's always very clean and well lit. The people in the front office are friendly and helpful. I've always been able to get in and out of the facility with ease, with a convenient parking spot close to my space. I feel safe going there and have used it for many years now. I would recommend the Chatsworth Devonshire location. Frank and Guillermo are really great. I am sure I have been a pain at times, but they always are helpful and show me the greatest resect. They are always concerned about security, which makes me feel better. These guys don't cut corners, which is why their facility is so well run. I would recommend this place to anyone. take Topanga Canyon Boulevard south to Devonshire Street. Turn left on Devonshire and head east- Extra Space Storage is just before the railroad tracks. Our address is 21536 Devonshire Street. take Topanga Canyon Boulevard north to Devonshire Street. Turn right on Devonshire and head east- Extra Space Storage is just before the railroad tracks. Our address is 21536 Devonshire Street.